Located at the corner of Stanger and Old Turner Streets. Kelly Hall contains 100,000 square feet of engineering-led research labs, offices, and workspaces. Kelly Hall serves as the research institute's headquarters. The Virginia Tech – Wake Forest University S chool of B iomedical E ngineering & S ciences (SBES) is a unique multidisciplinary program which couples the biomedical sciences, biomedical engineering, and real-world applications to enhance the quality of life. Our world-class faculty and students innovate and discover across a continuum of systems, from natural to engineered to medical. SBES is a fully joint graduate program formed in 2003 that brings together three prestigious academic units: the Virginia Tech College of Engineering, the Wake Forest School of Medicine, and the VA-MD College of Veterinary Medicine. Each of these separate entities contributes unique strengths to the combined enterprise so that students are offered a wide spectrum of first-class educational and research opportunities in a beautiful part of the country. The SBES program is available to students at two campus locations. Blacksburg, Virginia is home to the VT College of Engineering and the VA-MD Veterinary College, both of which provide faculty to the program. Winston-Salem, NC is the home of the Wake Forest University Baptist Medical Center consisting of Wake Forest University Health Sciences and North Carolina Baptist Hospital. Contributors to SBES include the clinical departments and the Department of Biomedical Engineering. Students are encouraged to adhere to the concentration area requirements specified by each faculty group; however, declaring a specific area is not required. SBES encourages innovative thinking and novel approaches to problem-solving and seeks to tailor students' academic programs to their individual goals and research ambitions. Please refer to www.sbes.vt.edu for further details regarding concentrations. One campus is chosen as the “home campus” but students have the opportunity to experience both environments and the faculty of each through courses taught by video broadcast and by inter-campus visits. Many research projects are collaborative efforts between faculty and students across the two locations. All PhD students experience a required Clinical Rotation course much of which is given at the Medical Center in Winston-Salem. Students successfully completing a graduate program in SBES will receive a joint degree from Virginia Tech and Wake Forest University. The diploma displays the names and seals of both institutions. 15 credits of engineering courses (BMES or from any engineering department) to include the required courses, Quantitative Cell Physiology and Quantitative Organ Systems Physiology. Ph.D. students must complete training in Ethics, required by the graduate schools, which must be noted on the plan of study. See the SBES Graduate Handbook for details regarding implementation on each campus. Students are also required to enroll in and successfully complete the SBES Seminar course (BMES 5944 at VT and BMES 694 at WFU) each semester of all the academic years during their degree program. Ph.D. students must pass a Qualifying Exam no later than the end of the second year for students entering directly into the Ph.D. program or within one year of entering the program after completing the M.S. degree. ALL students are expected to participate in the annual Research Symposium held each spring, and are required to do an oral research presentation at least once before they graduate. Ph.D. students may elect to earn an M.S. degree as an intermediate milestone to the Ph.D. with the prior approval of their advisor. They must file an M.S. plan of study at the end of the second semester of study, and write and defend a thesis. Please refer to www.sbes.vt.edu for details regarding all degree requirements. 9 credits of engineering courses (BMES or from any engineering department) to include the required courses, Quantitative Cell Physiology and Quantitative Organ Systems Physiology. All coursework must be at the 5000-level or higher (Blacksburg) and 600-level or higher (Wake Forest). M.S. students must also enroll in and successfully complete the SBES Seminar course (BMES 5944 at VT and BMES 694 at WFU) each semester of all the academic years during their degree program. M.S. students must complete training in Ethics, required by the graduate schools, which must be noted on the plan of study. See the SBES Graduate Handbook for details regarding implementation on each campus. A written plan of study is to be submitted at the end of two semesters of graduate study. All M.S. students write and defend a thesis. There is no non-thesis M.S. degree in SBES. ALL students are expected to participate in the annual SBES Research Symposium held each spring, and are required to do an oral research presentation at least once before they graduate. 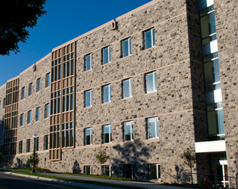 On the Blacksburg campus SBES occupies Kelly Hall, on Stanger Street with approximately 30,000 sq. ft. of laboratory space designed specifically for cutting-edge biomedical research. Also available to graduate students at Blacksburg are the superior facilities of the Veterinary College (VMRCVM) which is part of the SBES alliance, the Virginia Bioinformatics Institute, located on the VT campus, and most recently the Virginia Tech Carilion School of Medicine and Research Institute (VTCRI) located in Roanoke, VA.
At Winston-Salem SBES students have access to top quality research resources through the Wake Forest University School of Medicine and its affiliation with North Carolina Baptist Hospital, one of the finest in the country. Additionally, SBES has ties to the Wake Forest Institute for Regenerative Medicine (WFIRM), an international leader in bringing cell and tissue engineering discoveries to clinical therapies. The WFIRM and other research groups are part of a 200-acre biotechnology initiative at the Piedmont Triad Research Park which will be the largest urban research park of its kind in the nation. The Bioanatomic Imaging and Treatment (BAIT) Program is a clinical and research program at North Carolina Baptist Hospitals and Wake Forest University School of Medicine. BAIT clinical and basic research focuses on the uses of bioanatomic imaging and treatment for patients who have cancer, on understanding the biological mechanisms of cancer as can be seen with imaging, and on radiation treatment responses. Our scientific programs include image-based clinical trials and basic research in imaging science and radiation treatment physics. website here. Bioelectromechanical Systems is a cross disciplinary field that combines engineering and science from the nano to the macro level. In our laboratory we have developed technology for tissue viability detection, picoliter sample management, and imaging for molecular medicine. We have developed three inexpensive solutions that use electrical feedback to perform complex procedures in biotechnology with precision and control. Through this engineering approach, we have established robust methods for single cell analysis, selective cell concentration, and cancer therapy. website here. Nanotechnology is engineering at the molecular level. At Wake Forest University's Nanotech Center the revolutionary principles of nanotechnology are being used to address the pressing needs of human society from health care to green energy technologies. The Nanotech Center is a shared resource serving academic, industrial, and governmental researchers across the region. We welcome researchers from any discipline who wish to explore uses of nano-materials and nanotechnologies in their work. Website Here. Pericytes are cells that wrap around blood vessels to maintain their stability and regulate their diameter through vasomotion. Disruptions in pericyte contribution to the vascular wall can lead to disease progression including diabetic retinopathy. Dr. Chappell and his lab use computational modeling approaches in conjunction with real-time imaging of ex vivo and in vitro models of blood vessel formation to understand pericyte behavior during blood vessel formation in health and disease. Understanding the mechanisms behind pericyte recruitment and investment will provide rationale and guidance for targeting pericyte-endothelial cell interactions for therapeutic benefit. Because research brings hope, basic science, clinical and public health researchers at the Comprehensive Cancer Center of Wake Forest University collaborate to answer complex questions that lead to promising new treatments and therapies. The research programs are structured to optimize multidisciplinary and translational research. Our researchers work together to take the most promising discoveries from the laboratory into the clinic for the benefit of our patients and the cancer community as a whole. Website here. The Crash Injury Research and Engineering Network (CIREN) is a multi-center research program involving a collaboration of clinicians and engineers in academia, industry, and government. Together, they are pursuing in-depth studies of crashes, injuries, and treatments to improve processes and outcomes. Our mission is to investigate the dynamics and neuromuscular control of human movement, and to train scientists to become leaders in the fields of musculoskeletal, sports and orthopaedic biomechanics. The primary focus of the research conducted in the Granata Lab is injury prevention. Projects in the lab fall into 3 main categories: Athletic Injury Prevention, Lower Extremity Joint Arthritis and its impact on Movement, and Alterations to Movement that result from injury and pathology. Research in the LaConte Lab is devoted to advanced neuroimaging acquisition and data analysis approaches, aimed at understanding and rehabilitating neurological and psychiatric diseases. A major focus of the lab in an innovation in functional magnetic resonance imaging (fMRI) which we developed and call "temporally adaptive brain state" (TABS) fMRI. The inception of TABS arose from two major recent advances in neuroimaging, namely 1) the recognition that multi-voxel patterns of fMRI data can be used to decode brain states and 2) the emergence of real-time fMRI as a viable tool for neurofeedback. website here. The research at the Laboratory for Fluid Dynamics in Nature (FiNLab) is focused on two main themes: fluid flows in nature, and advanced computational methods for fluid flows. The natural systems studied at FiNLab range from insect respiratory flows, which occur at the microscale, to planetary atmospheric flows with length scales on the order of tens of kilometers. There is an emphasis on biomimetics for efficiency, resilience, and sustainability, on high performance computing, and on advanced multiscale computational modeling website here. The Mechanics of Soft Biological Systems Laboratory focuses on characterizing the mechanical properties of biological structures ranging from lipid bilayers to collagenous tissues in vertebrates and chitin-based tissues in invertebrates. The common theme of the lab is the study of the relationship between complex structures and mechanical behavior of biological system, using approaches that combine physically-sound theoretical models with novel experimental methods. website here. Our research is concerned with the new science and technology generated by applying micro/nanofabricated structures and devices to biological studies and biosensors. One emphasis in our research is to develop high-throughput microfluidic tools to manipulate and analyze single cells and extract biological information. Another thrust in the group is on developing flow-through electroporation for efficient gene delivery into cells. Our ultimate goal is to apply this technique to create genetically modified cells for cancer immunotherapy, stem cell therapy and tissue regeneration. website here. Biomaterials are an essential tool that provides the basis for bioengineered devices, growing and delivering cells, developing functional tissues, and engineering whole organs. Natural biopolymers that self-assemble on the nano scale have the potential to provide native cellular environments that facilitate the directed behavior of cells. Research conducted by the Nanostructured Biopolymer Engineering Lab makes use of naturally derived structural proteins for biomaterials development. Using primarily keratin proteins, Dr. Van Dyke's research group creates matrices and scaffolds used for tissue engineering and trauma applications, and studies their fundamental characteristics such as molecular self-assembly and structure-function relationships. Our research lab utilizes biomechanical, imaging and molecular biological approaches to study mechanisms of tendinopathy. Particular emphasis is placed on examining the therapeutic benefits of mechanical stimulation in tendon healing as well as understanding the roles of ADAMTS enzymes in aberrant extracellular matrix remodeling of skeletal tissues. The focus of the Magnetic Resonance Quantitative Imaging Lab is to develop quantitative imaging techniques with magnetic resonance imaging to answer scientific questions and improve patient care. These imaging techniques are being used in numerous collaborative projects ranging from temperature mapping to evaluate new hyperthermia treatments with multiwalled carbon nanotubes, to measuring cerebral blood flow for improving patient care, to using phase contrast imaging to measure vascular stiffness. Traditional medical imaging has largely been qualitative, that is, the intensity of a pixel is arbitrary and only conveys relative information when comparing pixels. In contrast, the pixel intensities in quantitative images are directly proportional to a physical parameter (temperature, density, blood flow, velocity, concentration, etc.). This type of imaging provides repeatable, observer-independent measure of physical quantities. Our lab studies the biomechanics of motion in animals, conducting integrative research that crosses traditional boundaries of engineering and biology. Currently, two broad themes of our research center around gliding flight in vertebrates and internal fluid flows in invertebrates. We aim to understand animal movements both for fundamental understanding of animal physiology, ecology and evolution, and as inspiration for novel engineering applications. website here. The functioning of a living cell is governed by intricate networks of physical, functional, and regulatory interactions among different types of molecules. Recent experimental advances have yielded unprecedented insights into the structure of these interaction networks and into patterns of molecular activity (mRNA, proteins, and metabolites) in response to different conditions. The ultimate goal of my research is to build phenomenological and predictive models of these networks by developing approaches that investigate the relationships among the molecules in a cell, how these elements are organized into functional modules, how these modules interact with each other, and how different modules become activated or de-activated in various cell states. Website here. We are an interdisciplinary group of scientists using the tools of nanotechnology to study biology at the smallest scale. Our goals are to learn more about the basic functions and interactions of biological molecules and to use what we find to achieve new capabilities with biomedical implications. In pursuing this goal, we bring together aspects of physics, engineering, molecular biology, and many other disciplines. Website here. The LITE lab's main thrust is in using the tools of micro/nano technology and tissue engineering to study the role of cell-microenvironment interactions in cancer. One aim is to develop new engineering tools and in-vitro culture platforms to illuminate cellular response to microenvironmental cues (i.e. cell-cell, cell-matrix, chemical, electrical) and stresses (i.e. hypoxia, radiation, drug treatment) in a physiologically relevant 3-D context. website here. Research conducted at the Virginia Tech Carilion Research Institute (VTCRI) creates a bridge between basic science research at Virginia Tech and clinical expertise at Carilion Clinic and increases translational research opportunities for both partners. Research conducted by scientists at the institute is aimed at understanding the molecular basis for health and disease, and development of diagnostic tools, treatments, and therapies that will contribute to the prevention and solution of existing and emerging problems in contemporary medicine. Research areas of emphasis which presently align with areas of strength and active research at Virginia Tech include inflammation, infectious disease, neuroscience, and cardiovascular science and cardiology. website here. The X-ray Systems Lab aims at developing novel medical imaging technologies for biomedical and bioscientific discovery, radiological diagnosis, and medical intervention. Directed by Dr. Guohua Cao, the lab focuses on novel x-ray sources, detectors, and system engineering. Our research activities are interdisciplinary and translational, and interface between basic sciences, translational development, and clinical applications. website here.